When Dogs Snowboard from Mountain High Resort on Vimeo. Not really! The best in show went to Sadie a Scottish Terrier. Bulldogs make their mark again at the 134th Westminster Kennel Club Dog Show! Razzle Dazzle the 3 year old, 50 pound female who won the best in breed went on to claim 3rd place in the Non Sporting group last night! 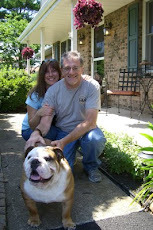 She is on her way to being one of the most successful Bulldogs in 30 years just winning her 27th best in show last month! 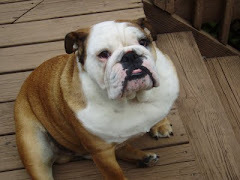 Actually the winner of the Non Sporting group went to a cousin of the bulldog a French Bulldog named Ch. Robobull Fabelhaft I'm on Fire! 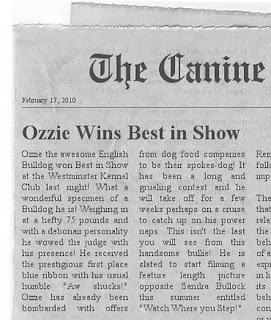 While the Shar-Pei took second and the Miniature Poodle took 4th place. Ozzie slept soundly on the couch while the judging took place. I attempted to rouse him from his slumber when Razzle Dazzle won her ribbon but he was totally unimpressed and went back to sleep! Tonight we will see the rest of the groups and the Best in Show. I am sure Ozzie will be sound asleep through that as well. Perhaps dreaming of winning Best in Show himself. Then running to the prize of a 20 pound sirloin steak and devouring it! Sweet dreams my champion bullie! Just a reminder that tonight the Non Sporting dogs will be strutting their stuff for the judges at the Westminster Kennel Club competition! I am sure Ozzie will be glued to the tube for this one, cheering on his comrade bulldogs! Or maybe he will just be glued to the couch dreaming of winning a ribbon himself! Valentines Day is this Sunday and with it the celebrating of love and affection between intimate companions. There will be the exchange of candies and flowers and of course the traditional Valentines Day card. Although the connotation of Valentines isn't always pleasant for everyone. For those without a significant other it is painfully referred to as "Single Awareness Day". It is a challenge for them to get through a Walgreen's without bumping into a heart-shaped something or other to remind them of their oneness! As for tradition the name Valentine was identified with a group of early Christian martyrs. Nothing romantic about that! Then there is the infamous Valentine's Day Massacre that took place in Prohibition era Chicago! I wonder if they found Valentines Day Cards in any of the dead gangster's coat pockets? Intended for some gangster moll that would never receive their pledges of love from their special thug! I am a little wiser and older this time around and don't expect lavish gifts from my hubby. In matter of fact I would be surprised if he splurged for a card! Needless to say there will be some obligatory trinket and maybe dinner out! This year is a different because I have Ozzie. Every time he sees me his little corkscrew tail wags with affection and he always wants to be by my side. You can't beat that for love and dedication now can you?! That is better than any Hallmark card! 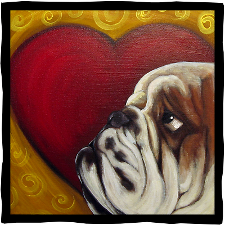 I think that if Jenny Sanford and Elizabeth Edwards both go out and get a Bulldog they will be better off this Valentine's Day than they were last time around! Any way let me go and least get a card from me and the Oz to my husband. Oh yeah and there are chocolates involved in this too! One for him three for me! The Dog Days of Winter! It is snowing like the Dickens here in the North East today! Our area dodged the bullet last Saturday when a snow storm battered the Mid-Atlantic including southern Jersey. We are certainly getting our share now! We must have at least 5 inches on the ground with another 7 to 13 inches predicted through out the day into the evening! Ozzie is excited about all this new precipitation! He loves to get out there and gobble up the snow like it was some giant snow cone from the gods! He has managed the Bulldog squat to pee but if it gets any deeper out there I will have to shovel him a little alley way for his business! In the meanwhile we will just kick back and enjoy the winter wonderland from our living room window! What's a guy have to do for some grub around here?! 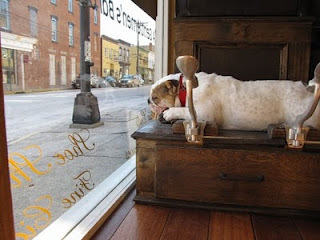 Harley, the nine-month-old English Bulldog greeter at the Old World Shaving Co., in Redbank NJ, enjoys the relative warmth of yesterday’s temps from her perch on an antique shoeshine stand. Don't fret Harley! According to Ground Hog Staten Island Chuck, Spring is just around the corner! The Really Big Dog "Shoe"! The month of February brings us weather predicting Ground Hogs, Valentines Day cards and the Westminster Kennel Dog Show! Scheduled to air on USA network on Monday and Tuesday February 15th and 16th it will have thousands of dog owners glued to their sets to cheer on their favorite breed! Of course there is no question on the breed we will be rooting for in this house! 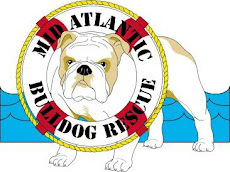 Since 2007 the Bulldog has made the top four winners in the Non Sporting group which will be judged on Monday the 15th. 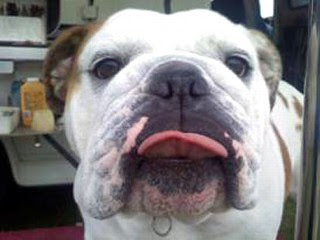 Non Sporting dog is a befitting category for the Bulldog. For the most part their favorite Non Sport is sleeping! I have enjoyed watching this WKC show even when I didn't own a dog. It's just fascinating how many breeds there are! They are just wonderful to watch as their handlers have them strut up and down and show their stuff for the judges! I couldn't even begin to imagine Ozzie walking back and forth for any judge! I could see him totally resisting with his legs cemented to the floor while the poor hapless handler pleads with him. Yes it would be all wrong! Ozzie prefers to be an observer! Quietly napping with one eye open while the rest of the pack compete for top dog! It's okay Oz your top dog with me even if you don't have a blue ribbon to prove it! Check out WKC website for info on this year's show and some interesting facts!